We asked one of our clients to give us their impressions at a China factory visit during procurement recently. Read below to get an idea of how they felt during this trip regarding the manufacturing problems faced. This is one of a series of blogs that we will title: Buyer Diary. When embarking on a China Factory Visit, do expect to encounter certain manufacturing problems, especially with unprofessional factories. These manufacturing problems can be highly detrimental towards production. For example, there could be production lag or a poor quality production. What are some common manufacturing problems faced? After an entire month in a factory together with ODM, we have overcome the sudden manufacturing problems that were brought to our attention in that short period of time. 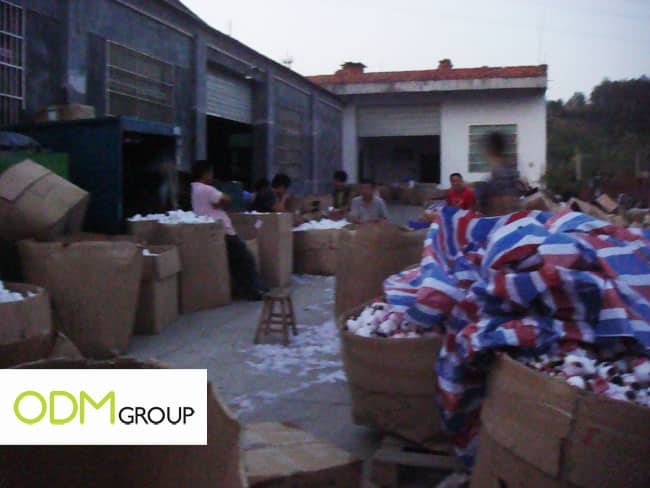 Factories are still found in Villages in China such as 义乌 (yiwu). In these locations, power failures are a common manufacturing problem faced by factories. These power failures are usually twice or thrice per month, each being at least a day long. Under such circumstances, there is absolutely no way where manufacturing can proceed on as per schedule. Which results to a production lag for a couple of days. This may not seem as a pressing issue, however the urgency is only faced when the goods are in a tight deadline. In order to make use time, production stages which do not require electricity could be carried out in the day. Usually by 5 in the evening, factory workers would have left the factory as there is insufficient light to continue on. Especially for small factories, it is likely to face insufficient storage space as one of the manufacturing problems. During the last factory visit, we encountered a massive storage lack as shipment was delayed. Therefore, we had a lesser space to store more goods. Subsequently, we have negotiated with the factory to rent a separate warehouse which is a mile or two away from the factory. Of course, this has pros and cons as well which will be explained later on. It’s all about convenience, especially when goods are transported back and forth. This not only applies to the shipment of goods when they are loaded into freight containers, but also in the very first phase of manufacturing when raw materials are required to be transported to the factory. It is important to select a factory that is located in an area with good transportation utilities as compared to factories in villages with a one-way road. It is likely that the factories will face problems with freight containers trying to make their way to the factory and back to the port. Given my humorous experience, this should be the perfect example of the factory location being a potential manufacturing problem faced. It was all arranged then, we arranged for a high-cube container to ship the goods. Unfortunately, the container could not arrive at the factory as there was a bridge obstructing it. It resulted in a delayed shipment time which we have emphasized time after again to avoid at all costs. This is one of the main manufacturing problems that is faced by most customers. Irresponsible factories could increase the price of the product as and when they like. Sometimes it may be due to a wrong quotation which they have done previously, or it may be just due to pure greed. It is important to select a professional factory to work with in order to avoid problems such as massive price increments and therefore resulting in overspending. Most factories have the “get it over and done with” mentality. They take no pride in workmanship and the quality of the goods. They focus on speed, quantity and profits most of the time, which results in a badly manufactured product. Once you are experienced, you can tell that this is the source of most problems when dealing with factories. As clients, we focus on the quality of the goods. On the other hand, the factory focuses on speed and quantity. This is also why quality control is introduced. Quality control does not allow clients to be too strict; neither does it allow factories to be too sloppy. Of course, these problems cannot be left hanging in the air. Stay tuned for the next entry as we propose to you feasible solutions to tackle these manufacturing problems.